In Lee's Garden Now is moving! Be sure to bookmark our new location! August 6, 2014, “Trials, tribulations, and rewards of growing fruit” meeting of Home Orchard Society (www.homeorchardsociety.org/), North American Fruit Explorers (www.nafex.org), and California Rare Fruit Growers (www.crfg.org) Conference, Troutdale, OR. August 9, 2014, “Uncommon Fruits for Every Garden” and espalier tour, Western Washington Fruit Research Foundation (www.nwfruit.org), Mt. Vernon, WA. 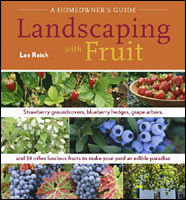 August 10, 2014, “Luscious Landscaping -- With Fruits!” sponsored by City Fruit, Bradner Gardens, Plant Amnesty, Seattle Fruit Tree Society, and the Washington Association of Landscape Professionals, http://leereich.brownpapertickets.com, Warren G. Magnuson Park, Seattle, WA. Earliglo strawberries are on the wane. Time to move on to other fruits, still strawberries but very different strawberries in all respect. Alpine strawberries. The largest of them are the size of a nickel but each packs the flavor of a silver-dollar sized berry. Alpine strawberry is one botanical form of wood strawberry (Fragaria vesca, often referred to by the French name, fraise de bois), a different species from the familiar garden strawberry. Wood strawberries are dainty plants that grow wild along the edges of woods in Europe, North and South America, and northern Asia and Africa. This is the wild strawberry of antiquity, mentioned in the writings of Virgil, Ovid, and Pliny, the strawberry that garlanded medieval religious paintings and was later depicted in grand proportions in Bosch’s Garden of Delights (c. 1500). The alpine form of wood strawberry was discovered about three hundred years ago east of Grenoble in the low Alps. It soon surpassed other wood strawberries in popularity because of its fruits are larger and borne continuously throughout the growing season, and because the plants do not make runners. I’ve even coaxed them to bear fruit in small (4-inch) flowerpots. Some alpine strawberries bear white fruits, and those are the ones I grow, for two reasons. First, the flavor, sweet and pineapple-y, is better than the red ones. And second, being white, the birds don’t notice them so I can wait to harvest until they are dead ripe and delicious. All season long. That same leisurely harvest is not possible with another uncommon fruit that’s just starting to ripen. Gumis (Elaeagnus multiflora) have a pleasant, tart flavor with a bit of astringency. More than a bit until they are thorough ripe. 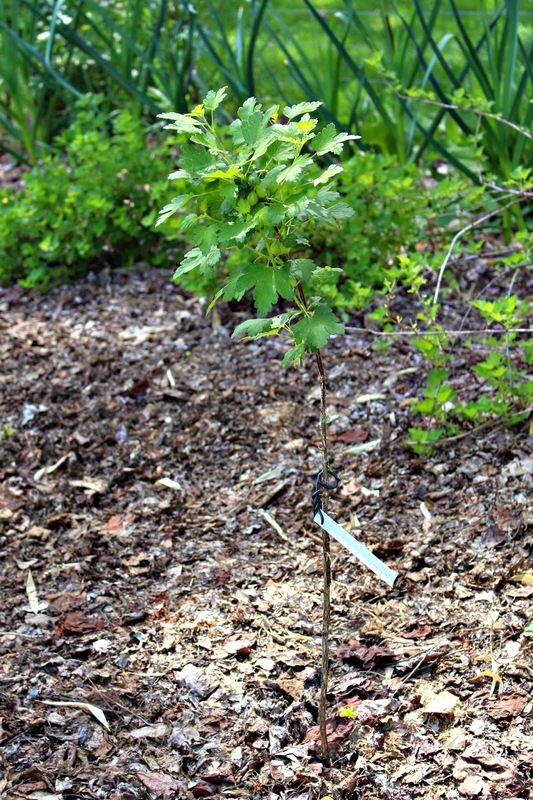 The variety I planted, Sweet Scarlet (from www.onegreenworld.com) may be a tad sweeter than run-of-the-mill varieties. The three-quarters-inch-long gumi fruits, scarlet red and speckled with silver, make a striking picture as they dangle on long stalks from the undersides of the branches. Birds also find the fruits very attractive. I’ve grown gumi for many years and last year was the only year in which I was able to harvest gumis ripe and in quantity. That was the one benefit of last summer’s invasion of cicadas, which birds evidently found more luscious than gums. Cicadas or not, I’ll keep growing gumis. The large shrubs are able to garner nitrogen from the air, the leaves have an attractive silvery sheen that contrasts beautifully with the scarlet fruits, and the flowers perfume the air with a sweet aroma. Perhaps the birds will leave me a few fruits to enjoy. 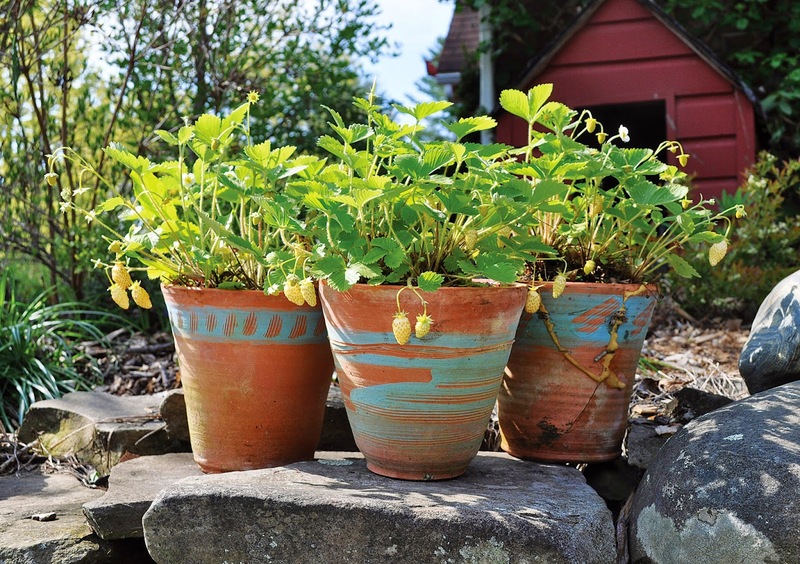 Read and learn more about alpine strawberries and gumis in my book Uncommon Fruits for Every Garden (2004). Let’s segue from tongue to nose and eyes. For years I’ve grown various David Austin roses with increasing success, the increase due to Mr. Austin’s breeding increasingly better roses rather than to my increased skill as a rosarian. It’s cold here on the farmden, and cold is what usually weakened or did in the roses. 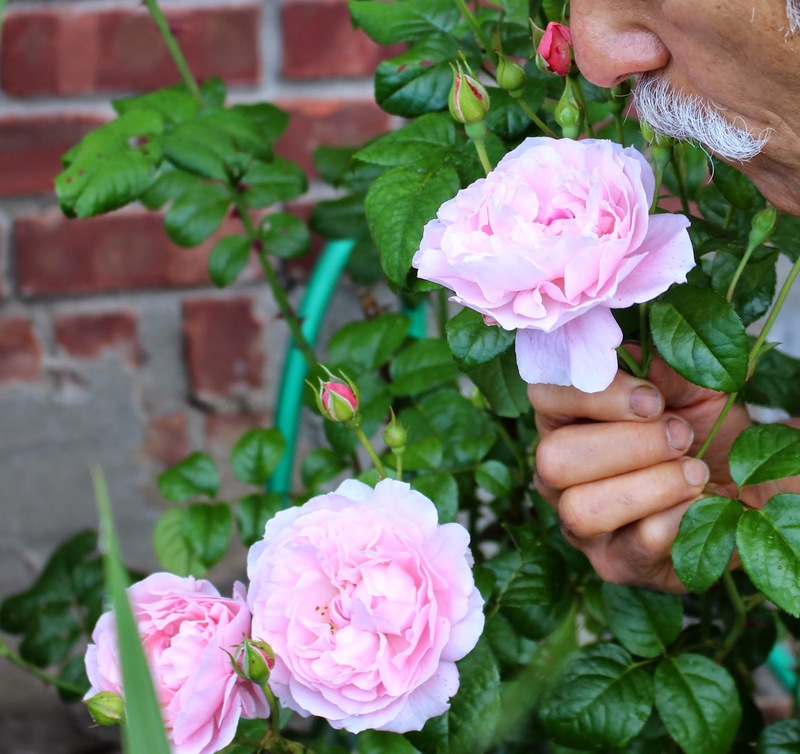 My attraction specifically for David Austin Roses lies in the full bodied bushes, their pest resistance, and -- most important -- the old-fashioned shapes (often rounded or cup-shaped), colors (often pastels), and fragrances of their blossoms. Last winter was brutal for many plants, roses included. Yet the variety L. D. Braithwaite rose, planted in an unprotected location just outside the vegetable garden, weathered the cold unscathed. It is now drenched in deep red blossoms against a background of reddish leaves. The variety Charlotte didn’t fare so well. It was killed to the ground, perhaps lower; I dug it up. The variety Strawberry Hill suffered some dieback despite protection afforded by the south-facing brick wall of my house. I’m glad I didn’t trash this bush because it’s also now covered with blossoms -- flat-topped cups of pink petals that emit a sweet, almost candy-like fragrance. Delicious! And more good scents: Catalpa. Although native to a relatively small area in the Midwest, catalpa can now be found throughout the East and as far west as Utah. And it’s spreading. But let me first backtrack to a few years ago at the local farmers’ market. 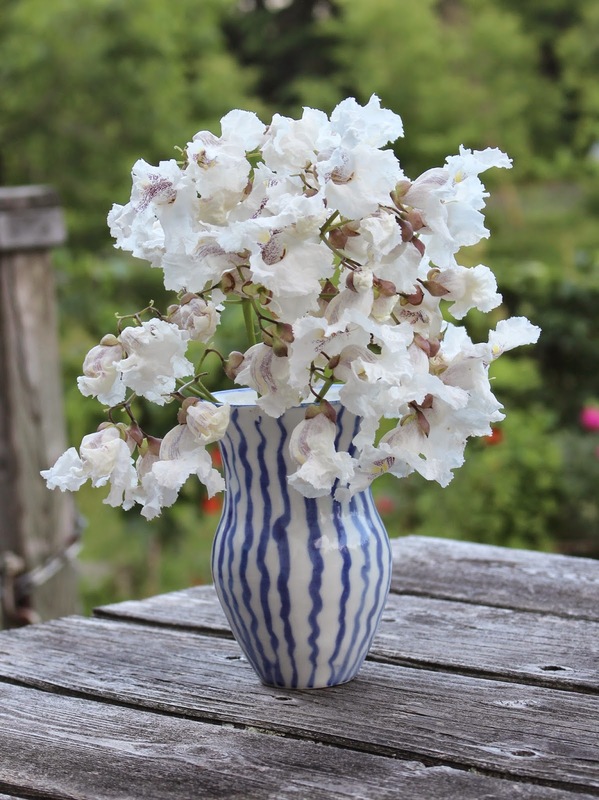 One farmer had buckets filled with white blossoms that rivalled orchids. I looked and looked at them, trying to figure out what they were, then finally asked. I was embarrassed to learn that they were catalpa blossoms, which I’ve admired for decades but always from afar and with their surrounding cloaks of large leaves. This year I decided to cut some blossoms, strip off the leaves, and put them in a vase. And that’s when their delectable scent was fully revealed. By the time you read this, catalpa’s will have finished blossoming. Mark your calendars for next year. Good gardening is not religion. Balancing and rebalancing is what’s needed, not the constraints of dogma. You want to garden naturally? Dogma would dictate doing nothing, in which case you wouldn’t have a garden. You want to grow only native plants? Then forget about tomatoes, apples, and tulips. And are the plants you want to grow truly native on your “back forty,” or down the road where the soil is slightly wetter in summer? Gooseberries and chickens are what turned my thoughts to the need for balance today. I grow over a dozen varieties of gooseberries, dessert gooseberries with flavors akin to those of grape, plum, and apricot. 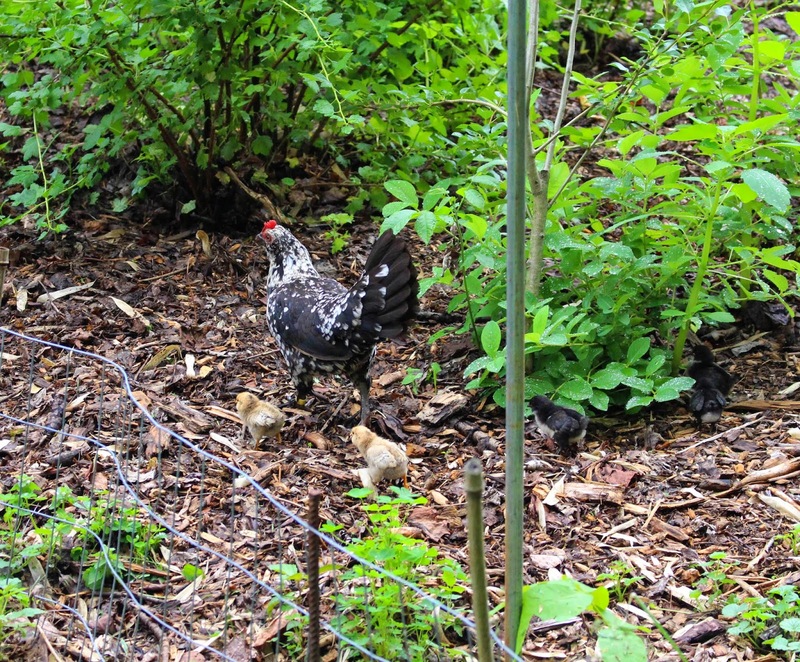 I also “grow” seven Bantam chickens; they provide decoration, insect control, eggs, and some degree of entertainment. A few days ago I noticed that this year’s especially good crop of gooseberries in the making were no longer in the making; most were gone. Gooseberries rarely suffer from late frost, at least here, so that could not be the reason. Gooseberries do not need cross-pollination, and, anyway, I have plenty of varieties for cross-pollination and bumblebees were buzzing all over the bushes in bloom. So pollination issues could not be the problem either. I lay blame for the paltry crop of gooseberries squarely on the shoulders of the chickens, who have been hopping the low fence around the planting for weeks. Mostly, they seemed to be scratching the ground beneath and around the gooseberry plants but I wouldn’t put it past them to help themselves to berries also. So, what to do? 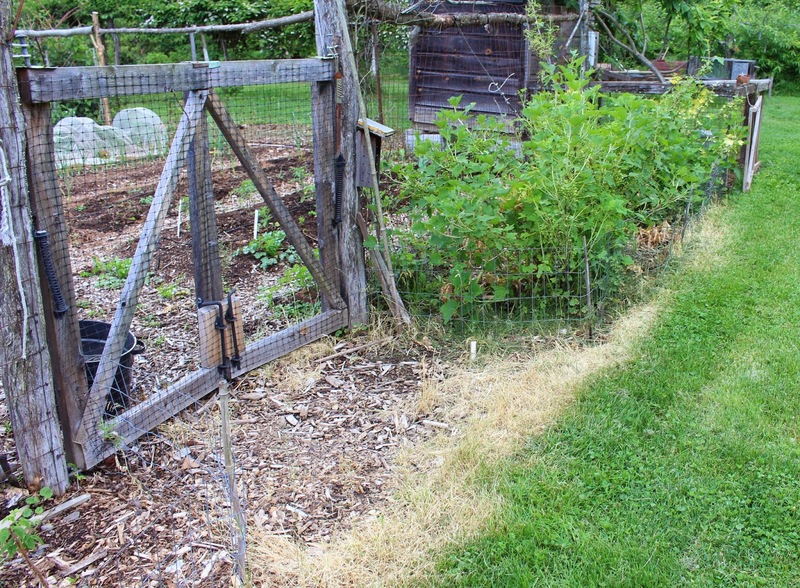 Putting a four-foot-high fence around the gooseberry beds would keep the chickens at bay but, with all the other fencing here, the scene could begin to look like a prison. The chickens could become soup. Or I could allow the chickens their indulgence. 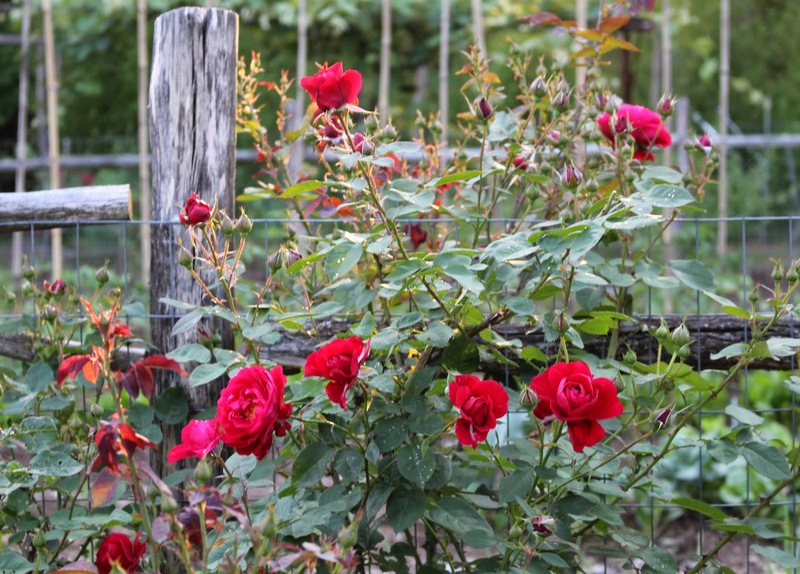 Another balancing act: Roses, now in bloom, look great either on the plant or in a vase. For roses that bloom all season long, cutting the blossoms coaxes new ones forth. A win-win situation. Except that towards the end of the season, it’s best that plants get ready for winter by slowing down and toughening up. Letting rose blossoms remain on the plant and go on to make fruits -- rose hips -- helps slow them down. A couple of weeks ago, a visitor looking at my asparagus patch commented on how nice it was that I still had asparagus to harvest. Of course asparagus was still coming on strong; it was only early June!Balance again. Asparagus is a perennial vegetable whose spring spears are fueled by energy stored over winter in the plants’ roots. 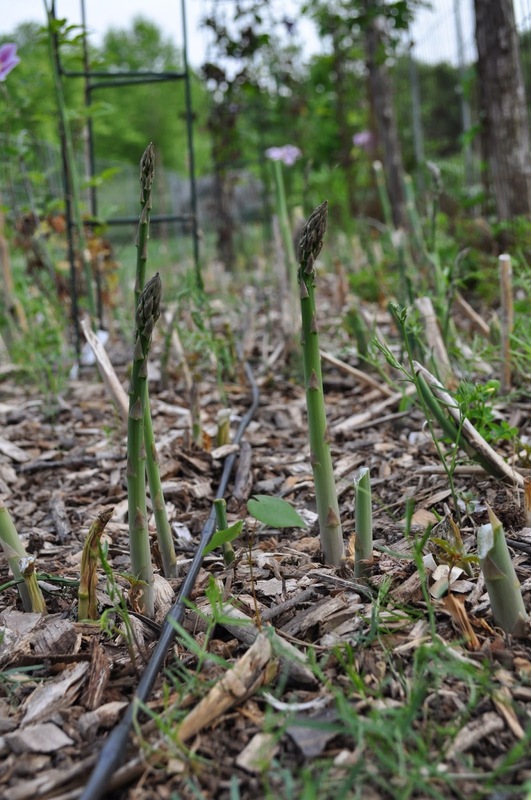 For a good asparagus harvest, the goal is to balance spear harvest against the plants’ need to pack away extra energy, created by photosynthesis, in their roots. Greenery is needed for photosynthesis. If spears are harvested all season long or even for too much of the season, roots are left with insufficient energy reserves going into winter. The result: Plants either die or push forth few, spindly spears the following spring. So the tack is to harvest for a period in spring short enough to let plants start packing away fuel for winter and the following spring. A good balance is struck by allowing about eight weeks for harvest. After the end of June, spears emerge and then unfold into those ferny fronds which, left untouched until they turn brown in autumn, have time to create energy and store away energy in the roots for another eight weeks of harvest the following year. With warm weather, asparagus needs to be harvest every couple of days or so. At each harvest, I cut down each and every spear, including those that are too skinny for eating or those that escaped previous harvest and have begun to unfold ferny foliage. Thorough harvest not only keeps new, fat spears emerging but also helps control asparagus beetles. These beetles feed on those early emerging spears. Cut all the spears early in the season and the beetles starve. If you have never seen the beetles, look on the spears for small, black specks. Those are beetle eggs. Just wipe or hose them off, or go ahead and eat them with the spears. Asparagus and eggs is a classic combination -- admittedly, the eggs for this combination are chicken eggs. Perhaps the chickens should stay. 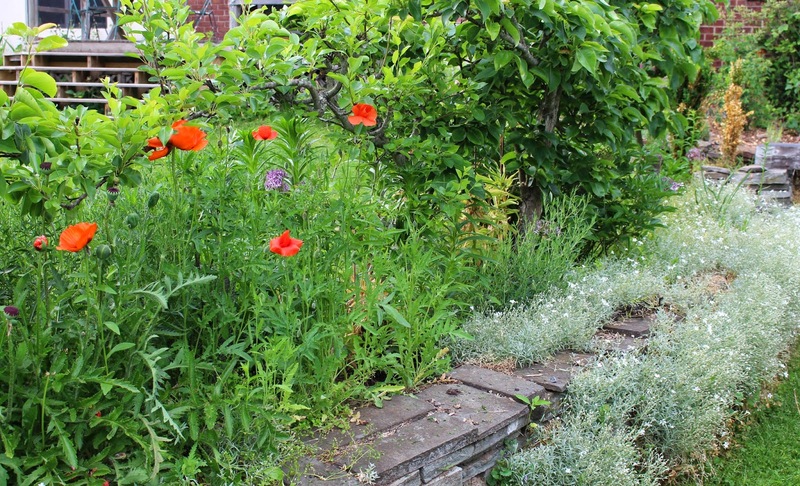 Oriental poppies, now in bloom with large, floppy, flaming red blossoms, are worth ooh-ing and ah-ing about. Likewise for Snow in Summer (Cerastium tomentosum), with small gray-green leaves and small white flowers, except that too few people know or grow this plant. Here, the two plants look especially congenial together with Snow in Summer hugging the ground at the feet of the poppies and spilling over the rock wall that supports the bed in which these plants grow. No skill is needed to grow Snow in Summer, or to propagate it. Plant it and it will spread, rooting as it creeps but never with frightening speed. Alas, the show from either plant is all too transient. Poppy foliage is soon to yellow and melt slowly back into the ground. And by the time you read this, blossoms of Snow in Summer will have tapered off and its leaves will have lost their exuberance of spring. The show’s transience makes it all the more appreciated. 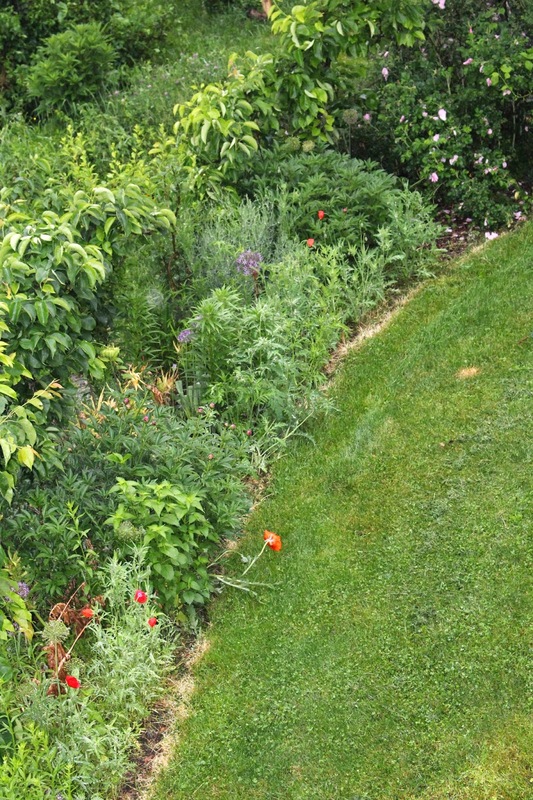 A narrow, yellow strip of vegetation -- dead vegetation -- sits at the bottom of the rock wall supporting the poppy and Snow in Summer bed (also home to espaliered pears, rugose rose, alliums, and other perennials) and at the its upper border with lawn. I can’t say that I’m proud of the yellowing strips of lawn and weeds, but the weedkiller I applied is very effective at keeping errant weeds and grass out of beds, paths, from climbing the rock wall and growing in between bricks of my terrace, and away from the bases of young trees. Weedkiller??!! Yes, I am spraying weedkiller . . . but the weedkiller I’m spraying is very benign. I take straight household vinegar, which is 5 to 6 percent acetic acid, and add to it, per gallon, 2 tablespoons of canola oil and 1 tablespoon of dish detergent. The detergent and oil help the vinegar spread out on and stick to the leaves. The USDA also has been researching the use of acetic acid as an organic spray to control weeds. They found 20 percent acetic acid to be very effective, which is not surprising. Twenty percent acetic acid, though, is neither very safe to use nor readily available. My vinegar concoction, at 5 to 6 percent acetic acid, is, of course, not as effective as the USDA’s 20 percent. Nor is it nearly as effective as the widely used chemical weedkiller Roundup. My mix only kills green leaves; Roundup is translocated throughout a plant to kill roots, stems, and leaves. Plants store energy in roots and stems so can recover from my spray to grow new leaves. Eventually, with repeated spraying, vinegar-sprayed weeds run out of energy and die. Plus, my mix is not much different from salad dressing (except that it would need more oil, some herbs, and no detergent). My aim is to spray frequently enough to kill each emerging round of greenery while it’s still drawing on energy reserves, before the leaves start socking away excess energy in roots and stems. Early in the season weekly sprays are needed; later, every two weeks or so. Because vinegar only kills greenery by direct hit, it is most effective on smaller weeds where there is no “shadow effect.” The vinegar spray’s effectiveness drops at temperatures below 70° F.
My farmden necessitates the application of about 8 gallons of vinegar mix per session, most easily applied using a backpack sprayer. Mixing up and spraying the mix is no fun but has become less unenjoyable with my new Jatco sprayer. Anyone who has used a backpack sprayer will appreciate Jatco’s rather unique qualities: a carrying handle, clips for holding the pumping lever and spray wand during storage or carrying, a large mouth for easy filling and cleaning, a mixing paddle that moves with each pump of the handle, and the totally internal pump that eliminates that awful sensation of spray material dripping down your lower back (even if it is just vinegar). The sprayer is almost perfect, two very minor shortcomings being the difficult-to-read volume indicator embossed on the tank and the lack of a bottom handle to grab when inverting the sprayer when cleaning it. The best thing about the Jatco sprayer is the good leverage afforded by the way the pump handle is connected to the pump. Less pumping means less work. Carrying 3 or 4 gallons of liquid on your back in the hot sun is work enough. Some people contend that the grass is always greener on the other side of the fence. I disagree, and especially this year. I’m acting on the belief that if more than three people mention the same thing to me, something is amiss. More than three people have commented on the beauty of their lawns this year, that is, the greenness of the grass on their side of the fence. And these are not people who tend to puff up their chests about their lawns. Nor do any of them hire Chemlawn or some other specialized lawn care company to douse their lawns with various potions to try to create a uniform, lush, verdant greensward. Anyone desirous of a lawn to reliably brag about year in and year out should move to Britain or some other country of northern Europe. 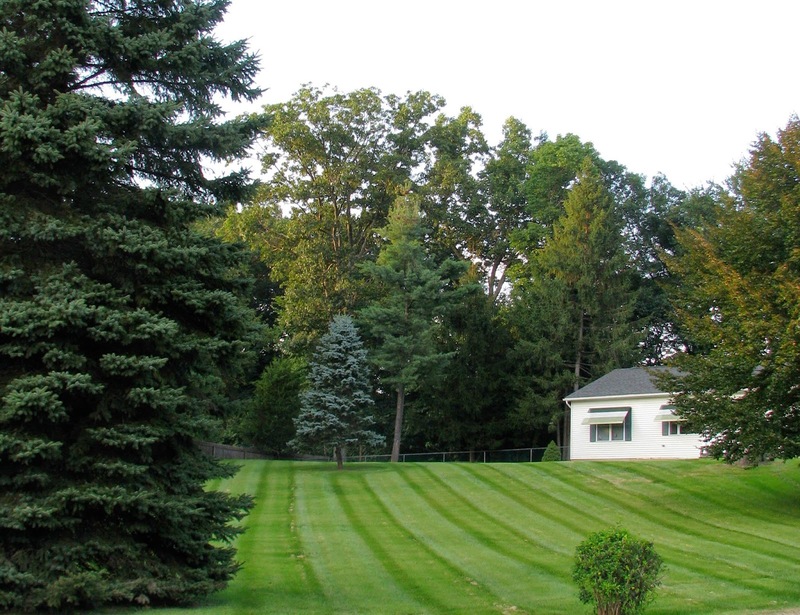 That’s where the climate is ideal for lawns, and where the fad originated. A lawn is a nice surface for children to play on and provides a homogeneous, calming backdrop to a garden and home. A lawn also can be a source of pollution from fertilizers and pesticides, provide food for grubs that become Japanese beetles, and can, if sufficiently expansive, be homogeneous backdrop to the point of boredom. I choose a middle way with my lawn: Lawn Nouveau (as featured in my book The Pruning Book). The more civilized area, that is, the area around my home, is mowed regularly. Further out, the grass or whatever else pops up is allowed to grow unfettered, except for being mowed once a year with either scythe or tractor. 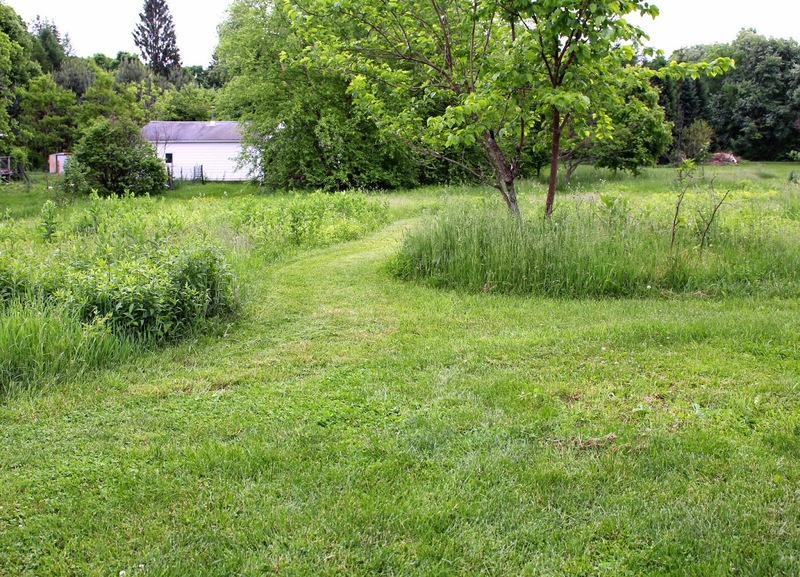 Two paths into this meadow are mowed as regularly as is the shorn lawn to provide enticement to walk into the meadow to get to the other side or to appreciate it up close or from other vantage points. Depending on the time of year, the weather, and when it gets its yearly mowing, the meadow might be awash in such colors as yellow from goldenrods or buttercups, or pastel blue from bee balm. I’m wondering if the shorn part of my lawn appears any different to anyone this year than in years past. To me, the grass is neither greener nor less green than on the other side of any fence. It looks the same as every year at this time: thick and lush. A couple of weeks ago I wrote about the imported currant worm, a bothersome pest that chomps all the leaves from gooseberry plants in spring. Oddly, it often ignores currants . . . but what’s in a name? I also wrote that one potential control for this pest might be to grow gooseberries as miniature trees. The worm lacks either the smarts or the energy to climb the leafless trunk to get at the leaves, or so my reasoning goes. I am training my tree gooseberry by pruning away all but the most vigorous, upright shoot and then pruning off the bottom-most two feet of leafy side-branches on that remaining trunk-to-be. I also pinched back the tip of that trunk-to-be at about 2-1/2 feet from ground level to stimulate branching, which has happened. Over time, the plant will attempt to send up new shoots from near the ground and along the trunk; I’ll cut them off. The cluster of stems up high will need annual pruning, just the same as if they were all growing from ground level. Another option would have been to graft a gooseberry variety onto the stem of a compatible plant that is more upright growing than gooseberry. European gardeners frequently grow their gooseberries as mini-trees, and create them by grafting on Ribes aureum, the golden currant, a native American plant. I grow golden currant and perhaps I’ll also try to make gooseberry trees by grafting. Tree gooseberries have their downsides and upsides. On the downside, gooseberries really prefer to grow as bushes. As bushes, they naturally grow new shoots at or near ground level, and those stems tend not to be long-lived. However, a new trunk can quickly replace a dead or dying one. The upsides to tree gooseberries are that the currant worm is thwarted, the fruit is held up off the ground, and -- to me, at least -- the plants look really cool. Last fall, I reasoned that the lack of berries could be that the plants were too young (no, I planted them over 15 years ago), that the plants were too shaded (if so, there would have been at least a few berries), that late frosts were killing the blossoms (unlikely every year), or that the planting lacked a male stud. 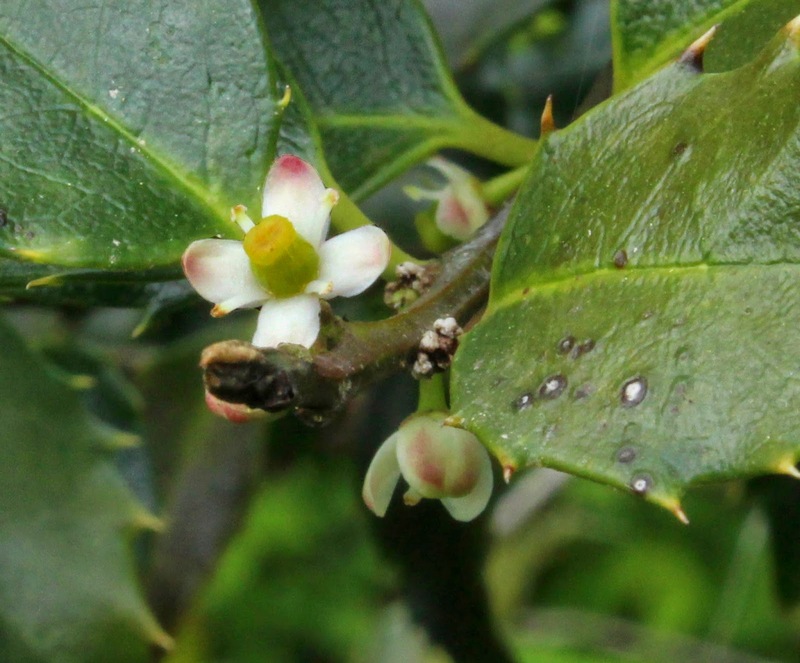 Except that I do remember making sure to plant one male holly for the harem of females. As luck would have it, coincidental with my connecting the drip irrigation, the hollies were in bloom. The blossoms are ornamentally insignificant but did provide the opportunity to confirm each plant’s sexual orientation. No magnifier was needed to see a swollen, green ovary at the base of the petals of each flower on all my plants. All my hollies are females. Right away, I started thinking of where, locally, I’ve seen hollies from which I could beg a few male blossoms, assuming other plantings have some males loitering about. Male flowers on a branch with its base in water would stay viable long enough for bees or me to effect pollination. 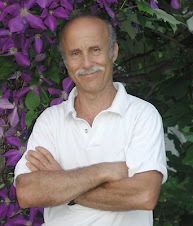 Once the drip irrigation was connected, I broke tradition, neglected my own advice, and planted out tomatoes, peppers, and eggplants transplants. The date was May 19th rather than my usual end of May planting date. These plants allegedly shudder at a temperature below 50°F., which was predicted and sure to occur again. I did offer them some protection in the form of light, air, and water-permeable “row covers” held up over the plants by double metal hoops (from www.gardeners.com or, as concrete block truss reinforcing wire, from a building supply store). A single hoop over the row cover at each double hoop holds the row cover in place while allowing it to slide up and down for access to the bed. Like holly berries, peppers, tomatoes, and eggplants are ripened ovaries -- that is, fruits (botanically speaking; horticulturally and legally, they are considered vegetables. As fruits, they need pollination to develop. The flowers, in this case, are monoecious (“one house”), with male and female parts on the same plant. More than that, male and female parts are on the same flower; the flowers are all bisexual. Pollen still has to move from the male parts of the flower to the female parts, and mostly, it’s bees that get that job done. Bees can’t get at plants within the row cover tunnels so once cold weather is reliably past I plan to uncover the rows and let bees work the blossoms. 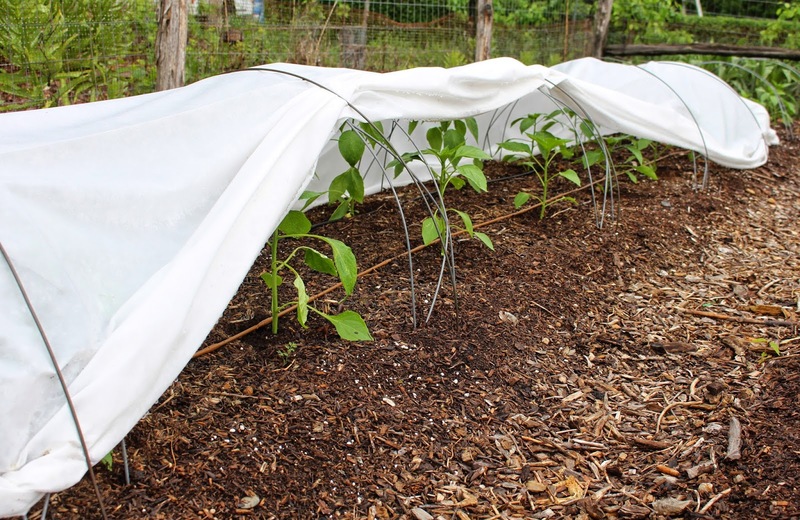 Row covers can also offer protection from certain pests. Anyone who grows eggplant eventually becomes familiar with flea beetles and the holiness they impart to the plants’ leaves. New growth on vigorous plants can more than offset older leaves’ loss of greenery but flea beetles can kill weak plants. So the tack here is to keep eggplant plants under row cover until their flowers begin to open. In addition to fending off flea beetles, the additional warmth and calmer environment beneath the covering spurs growth for earlier harvest and for a plant better able to fend off flea beetles once uncovered. With peppers, it’s especially important to pull off the cover just as soon as plants blossom. The atmosphere within a row cover tunnel is a few degrees warmer than ambient, which is helpful now, when some protection from cold nights might be needed. Fruit set for peppers is poor at temperatures below 58°F., so a little extra heat can improve early season fruit set. As days grow warmer, the even warmer environment beneath a row cover can have the opposite effect. Fruit set is also poor when daytime temperatures rise above 85°F. Tomatoes could remain covered throughout the season because bees are not necessary for pollination. Abetted with just a little movement -- from wind for example -- the mere opening of the flowers effects pollination. Night temperatures from 59 to 68°F. are best for tomato fruit set. Once night temperatures go higher than 70°F., fruit set suffers, but that’s not going to happen for a long time, even beneath a row cover. Or perhaps the lettuces and kales needed some fertilizer. Vegetables are generally heavy feeders, and leafy vegetables especially so. My garden doesn’t get fertilizer per se; the plants get all they need from compost. Years ago I calculated that a one inch depth of fully ripened compost could thoroughly satisfy the nutritional needs of vegetable plants -- even intensively planted vegetables -- for a year, and that’s what my plants get. As an added benefit, compost, in contrast to chemical fertilizers and even most organic fertilizers, offers a wide spectrum of nutrients in addition to just the big three: nitrogen, phosphorous, and potassium. Chemical fertilizers are salts (in the broad sense of the word, that is, any ionic compound and not only sodium chloride). Add them to the soil, and they are there for plant use. Not so for compost and most other organic fertilizers. To become food for plants, the latter must first be “mineralized,” that is, converted by soil microorganisms to ions. Microorganisms grow more and more active with increasing heat and moisture (to a point), so perhaps my plants were hungry because cold or dry soil was keeping microorganisms sluggish. And any available nutrients, whether their provenance is chemical or organic, needs to be dissolved in water before a plant can slurp them up. “April showers bring May flowers . . . “ blah, blah blah. Not so, at least in my observation the past few years. Aprils have tended to be dry. Dry soil slows plant growth and could be responsible for my kales’ yellow leaves. Mineralization is slowed and even if mineralized, insufficient moisture might be available to put those nutrients in solution. A problem with slow mineralization could have been resolved by applying compost the previous fall. Lingering warmth in the soil permits some mineralization, and nutrients would be ready and waiting come spring (with a winter’s worth of water putting them in solution). Usually I apply compost in fall but last fall did not get to all the beds. The problem has been resolved, simply, by watering. 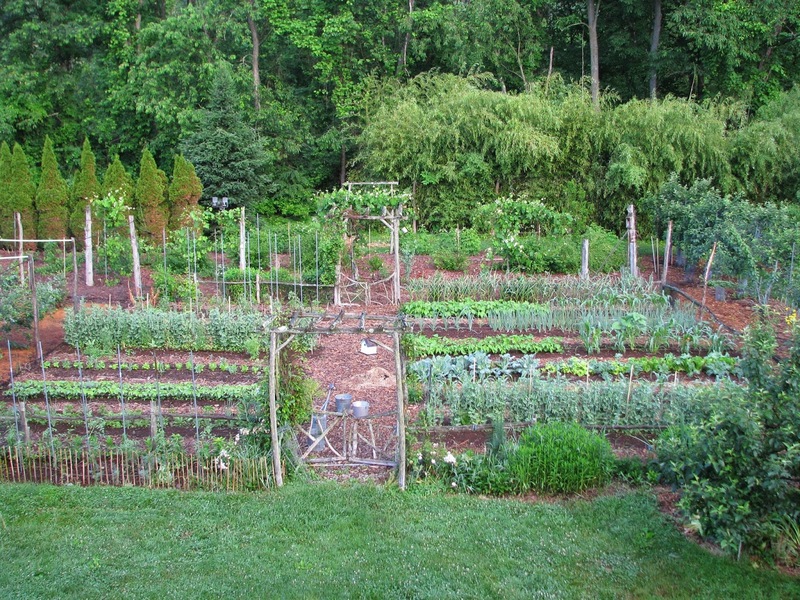 As supporting evidence, the drip line in one of the vegetable beds came loose from its source; kale in that bed remained sickly even as the watered beds sprung to life. For a quicker effect or where compost is not available, a concentrated organic fertilizer, such as soybean meal, might be in order. You might have guessed that soybean meal is high in nitrogen -- 7 percent -- since soybean seeds contain 40 percent protein and proteins are about 16 percent nitrogen. More recently, I’ve also been using alfalfa meal as a source of concentrated, organic nitrogen for plants or beds that need it. Being a legume, alfalfa is also high in nitrogen, but the meal is made by grinding up leaves and stems rather than seeds, so it is less concentrated in nitrogen (2 percent) than soybean meal. Alfalfa is a deep-rooted perennial whose roots forage far and wide for nutrients to possibly offer a bigger smorgasbord to plants than does soybean meal. Alfalfa meal also contains triacontanol, a natural compound that stimulates plant growth (not that I’m necessarily looking for any artificial stimulation fro my plants, whether from sources natural or otherwise). Both soybean meal and alfalfa meal are mostly used as animal feeds; as such, they are readily available at feed stores. Neither soybean meal nor alfalfa meal is the end-all for fertilizing plants. A serious concern with both is that they are mostly grown from GMO seeds. Also, neither provides a sufficiently broad spectrum of nutrients. Soybean meal provides mostly nitrogen and potassium; alfalfa meal mostly nitrogen and phosphorus. And finally, neither provides bulk that comes from carbohydrate compounds. This bulk has far-reaching benefits, fluffing up soils for aerations, sponging up water, feeding beneficial microorganisms, and, in addition to providing nutrients, making nutrients already in the soil more available to plants. Compost, leaves, and straw are among the organic materials that offer bulk. Why the focus on nitrogen when talking about fertility? Nitrogen is the most evanescent of the big three nutrients, and the one most likely to need annual replenishment. Nitrogen can leave the soil as a gas, can be washed down and out of the soil by rainfall, and can be taken up by plants. 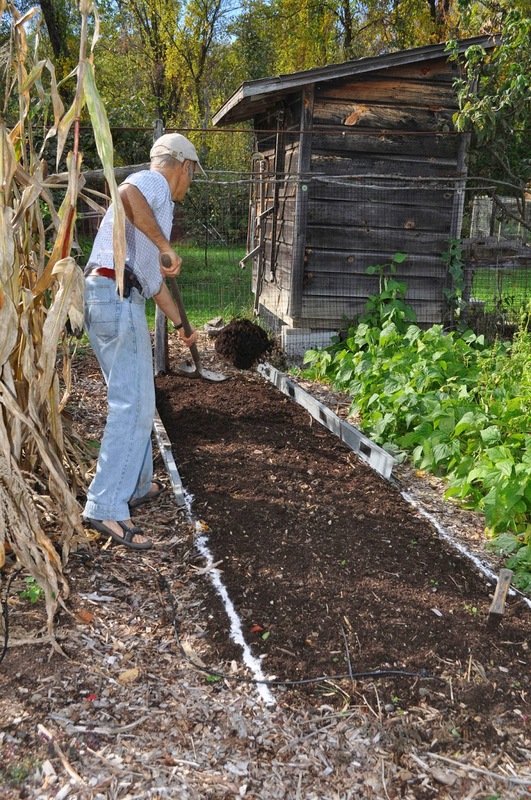 A soil regularly “fertilized” with bulky organic materials will have plenty of all necessary nutrients but could be temporarily short of nitrogen. Unless that bulky organic material is fully ripened compost. Yay compost! I actually have grown cardoon before, perhaps 25 years ago. And up until this weekend, I had no desire to ever grow it again. The plant is like a giant celery with spiny stalks that must be tied together so that they get blanched and edible. Or supposedly edible, once you removed the tough strings running down each stalk. Blanching and de-stringing was a lot of trouble, too much trouble for me considering the taste of what of the tough stalk after being cooked. 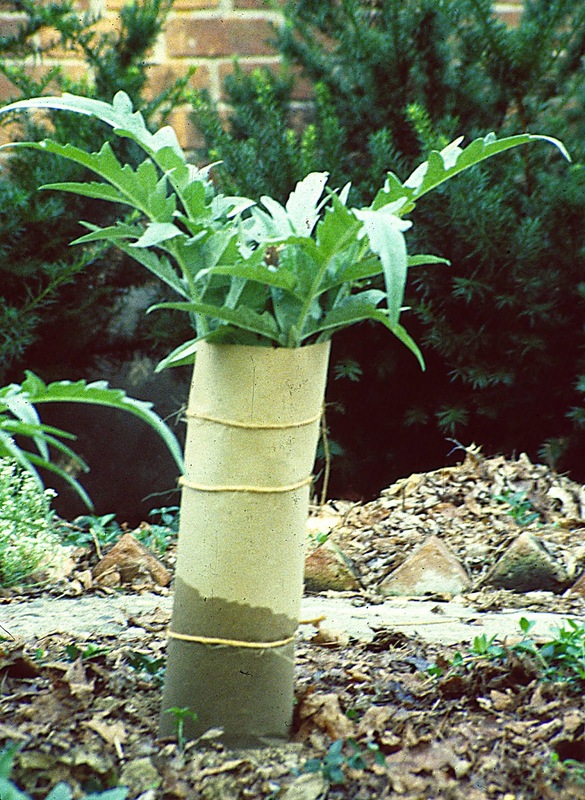 This weekend, two people at my grafting workshop digressed from grafting to wax enthusiastic over cardoon. Evidently, my problems 25 years ago were growing the wrong variety and cooking it poorly. I’m not sure if any varieties were available back then, but I was convinced to order seed of the suggested variety, Gobbo di Nizza (Hunchback of Nice), and will sow them in pots as soon as they arrive. Once the weather warms reliably, I’ll plant out two or three small plants, giving them rich soil. Once the plants are three feet high, I’ll mound some soil or wood chips up around their bases and tie the leaves together to blanch them, then a few weeks later, cut down the four-foot-tall monsters for eating. I was told that they taste like artichoke, a close relative. In warm winter regions, cardoon grows as a perennial. 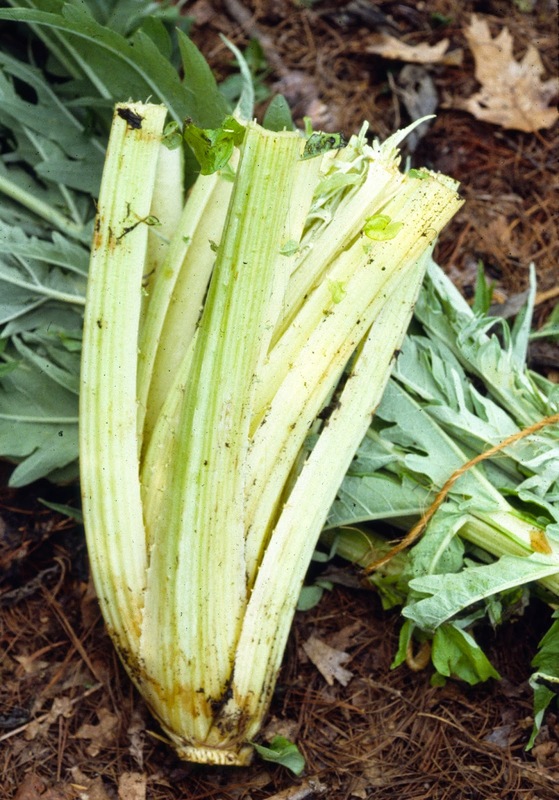 If winter’s were warm here, I’d plant cardoon even if they tasted awful. That’s because in their second year, they send up six-foot-high stalks capped with bottlebrushes of cerulean blue flowers that sit in an artichoke-y base. I’ve also previously grown -- or tried to grow -- the second of this year’s N&EP (“new and exciting plants”), King Red Russian olive. 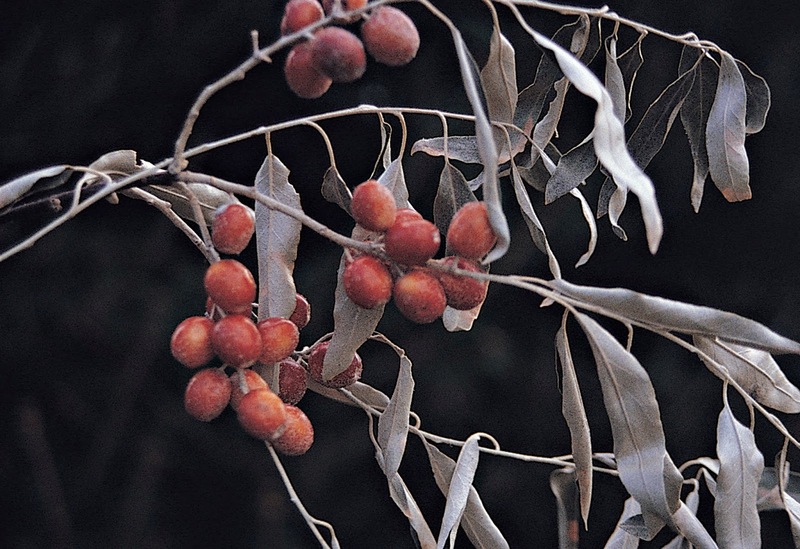 It’s a variety of Russian olive, native to Afghanistan, that, instead of bearing the usual innocuous silvery green fruits, bears bright red fruits. The fruits contrast nicely with the silvery green leaves -- and taste pretty good. For some reason, King Red doesn’t like our summer weather, probably the humidity. My plant of yore grew fine until sometime in July, when it collapsed, dead. Others in the humid East have had similar experiences. I’m thinking that somewhere in the genes of King Red, which is a seed propagated variety, not a clone, might lie genes that can tolerate our summer climate. 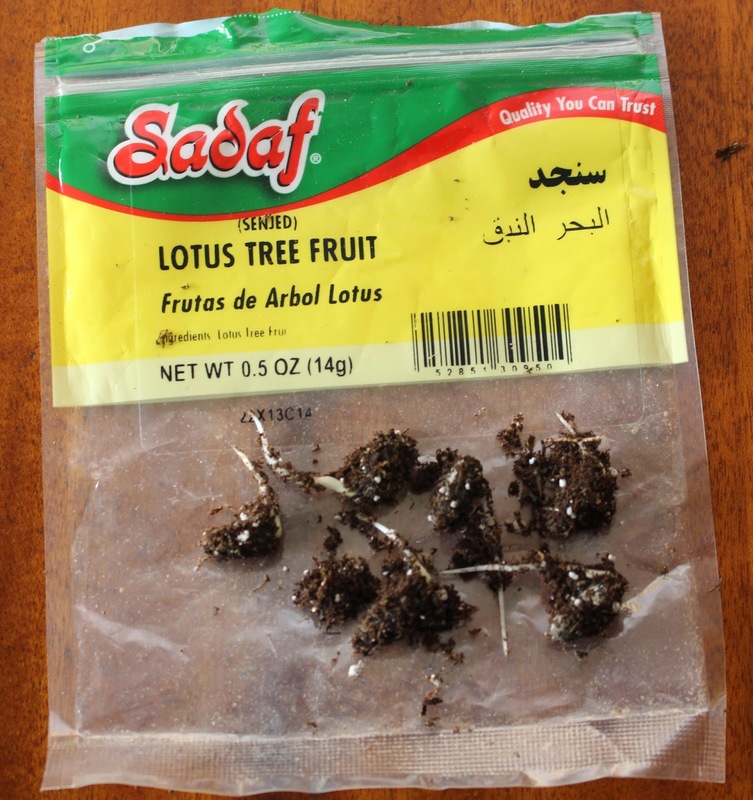 To that end, I got my hands on seeds left from a bag of imported, dried King Red fruits; I’ll sow them all and hope for the best. (I once tasted the dried fruits; they are like sweet talcum powder, enclosed within a brittle “shell.”) The fruits parade under a number of aliases: Trebizond date, lotus tree. Botanically, it’s Elaeagnus angustifolia var. orientalis. Another fruit, Ficus Afghanistanica, or mountain fig tree, is among my N&EP. With more than a half-dozen fig varieties in my not very fig friendly climate, you’d think I had enough figs. Mountain fig tree is worth a try for its hardiness, by some accounts to well below zero degrees F. Of less importance here in the humid East is its drought tolerance, which may be related and help with its cold hardiness. Also on the plus side, the plant has decorative leaves, similar to common fig leaves except pointed at their tips. On the negative, there’s some question as to whether this fig needs pollination, something most fig varieties do not need. If so, a special pollinator variety would be needed as well as some means to get the pollen into the eye of each fruit at the right time. A syringe filled with pollen? Figs that need pollination normally get their pollen with the help of Blastophagus, which are tiny wasps that, laden with pollen, enter the eyes of developing fruits to lay eggs and, in so doing, inadvertently pollinate the flowers within. The buttery pleasure of eating hickory nuts is offset by the tediousness of cracking and shelling them. That’s shagbark hickories (Carya ovata), which are native throughout eastern U.S.
Shellbark hickories (C. lacinosa) have similar nut flavor and shape, except that they are two or three times larger, so you get more bang for your buck with each nut you crack. Walking just a quarter of a mile in any direction, I’d be likely to find some shagbark hickory nuts on the ground but nary a shellbark hickory. The latter species is found mostly along the Ohio and Mississippi Rivers, and bordering regions; nowhere, though, is it common. So I ordered trees from Nolin River Nut Tree Nursery, and not just any old shellbark trees, but the varieties Simpson and Selbhers. Both are billed as heavy bearing and producing nuts medium to large nuts with excellent cracking qualities. Very “new and exciting;” I hope to enjoy the nuts of my labor in 5 to 10 years. To paraphrase Donald Rumsfeld, defense secretary under W, there are the known knowns, the known unknowns, and the unknown unknowns. Donald, you forgot about the unknown knowns. Lets talk about gardening, not war, and the knowns that need to be better known. Visitors to my garden (actually workshop attendees) were oohing and ahing over some 18-inch-high stalks each capped with a crown of leaves beneath which dangled a circle of red blossoms. 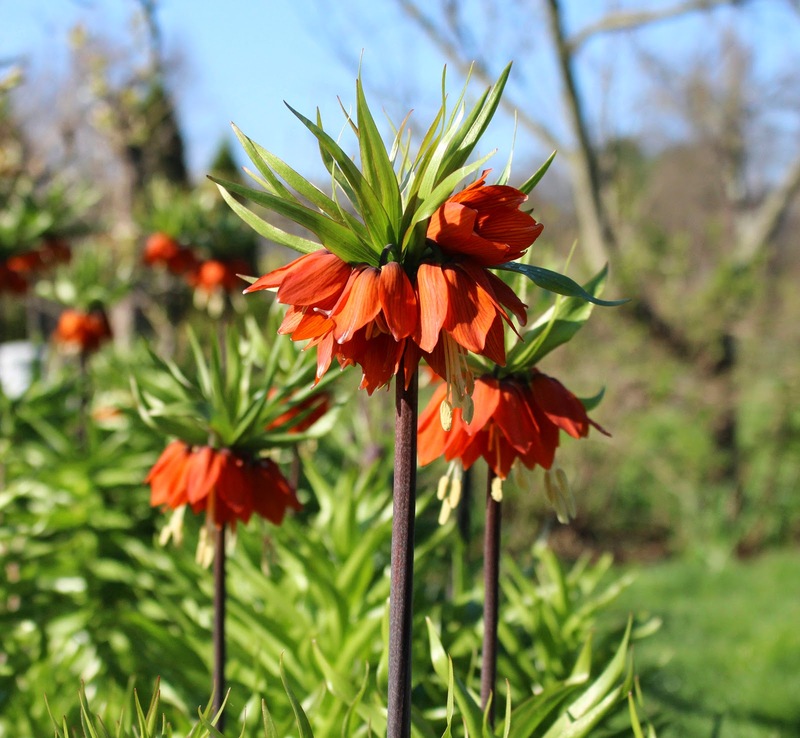 Aptly named crown imperial, Fritillaria imperialis, deserves to be more widely known. No one seemed put off by the skunky aroma that suffuses the air even feet away from the plant; I like it. Perhaps crown imperial would be better known if the bulbs didn’t go for more than 10 dollars each. My gardens’ profusion of crown imperial stalks is more an indication of my green thumb than my wealth. They all arose from a single bulb my father gifted me more than 20 years ago. I learned to propagate them by bulb scaling, which involves digging down into the ground to remove scales from the bulb, then mixing the scales with barely moist potting soil. After a couple of months storage at warm temperatures followed by a couple of months storage at cool temperatures, the scales can be potted up to be nursed for a season before planting out. Every year I make new crown imperial plants. Will I ever have too many? Crown imperial also has some unknown known kin. 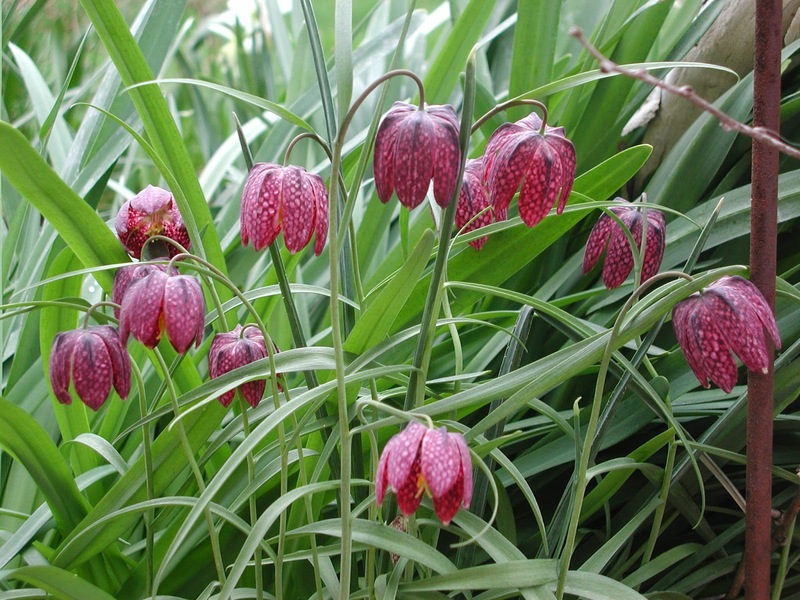 You have to see Persian lily, Fritillaria persica, to appreciate it. 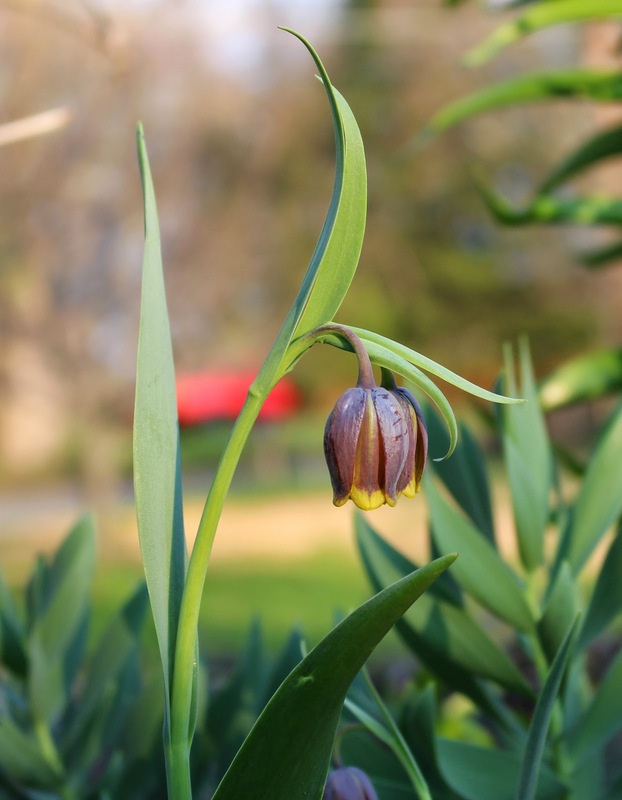 A written description -- foot-high stalks lined with nodding, small, plum purple to gray green flowers -- doesn’t do justice to the beauty of this bulb. I hope to start multiplying this one also. 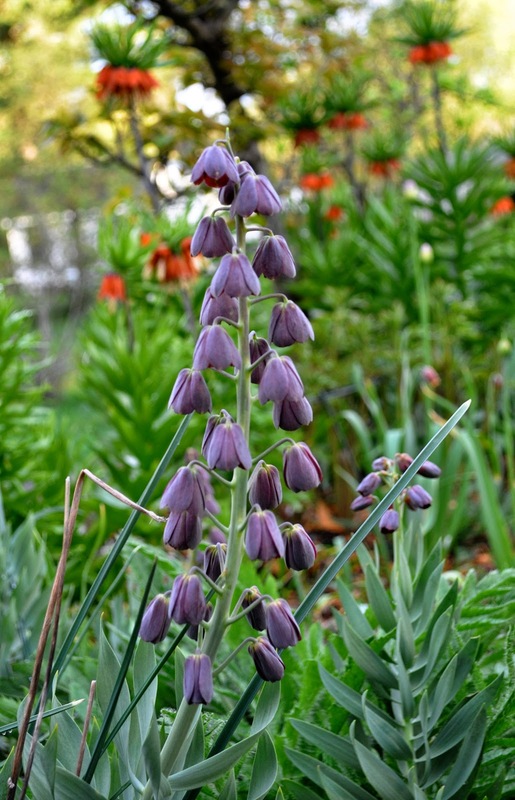 Another unknown known is Fritillaria michailovskyi, this one with nodding, bell-shaped flowers with yellow-tipped, purple petals. Among crown imperial’s kin is also a known known: Guinea hen flower, F. meleagris, with large, nodding, checkered flowers. Even White Flower Farm sells these bulbs for less than a dollar each. No wonder they are better known. Let’s segue over to unknown knowns among fruits. Right now, a billowing wave of white blossoms lines my driveway, the blossoms of Nanking cherry (Prunus tomentosum), a shrub that can grow 8 feet high and wide. The show matches that of any other flowering tree or shrub. What do other flowering trees and shrubs -- forsythia, lilac, flowering cherries, and the like -- offer after their flower shows subsides? Nothing, nada, zip. Nanking cherry, though, goes on to bear oodles of small red cherries with a flavor somewhere between that of sweet and tart cherries. And what does it take to get a decent crop of sweet or tart cherries? Pruning, perhaps spraying and bird control. 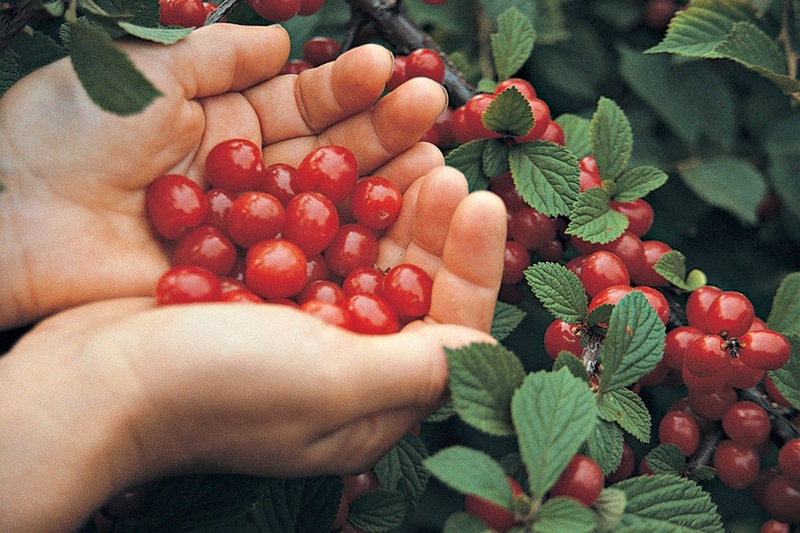 What does it take to get a crop of Nanking cherries? Nothing, nada, zip. The plants bear heavily with little or no care, and bear enough to satisfy birds, squirrels, and humans. Okay, every rose has it’s thorns. 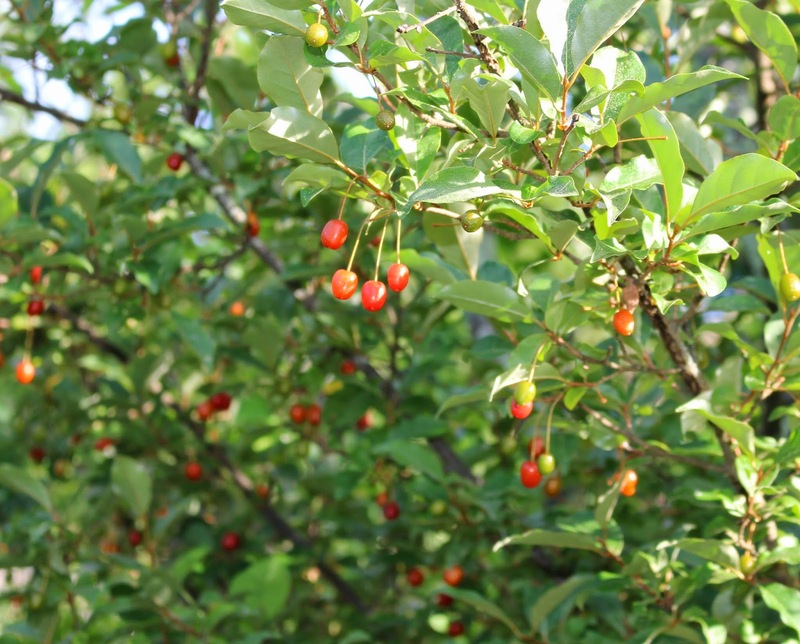 Nanking cherries are small, one-half to five-eighths of an inch in diameter. The smallness is more than offset by plant’s beauty, its profusion of fruits, and its low maintenance . And one more unknown known: gooseberries (both gooseberries and Nanking cherries warrant a whole chapter in my book Uncommon Fruits for Every Garden). Many people imagine all gooseberries to be small, green, and tart, suitable mostly for cooking. Not so! There are over a hundred varieties of gooseberry in various colors and sizes, and a whole category of them, what the Brits call “dessert varieties,” are for fresh eating. Good flavor is what should warrant gooseberries known known status among fruits. Most important in growing gooseberries is to choose a good variety, both for taste and for resistance to disease powdery mildew. 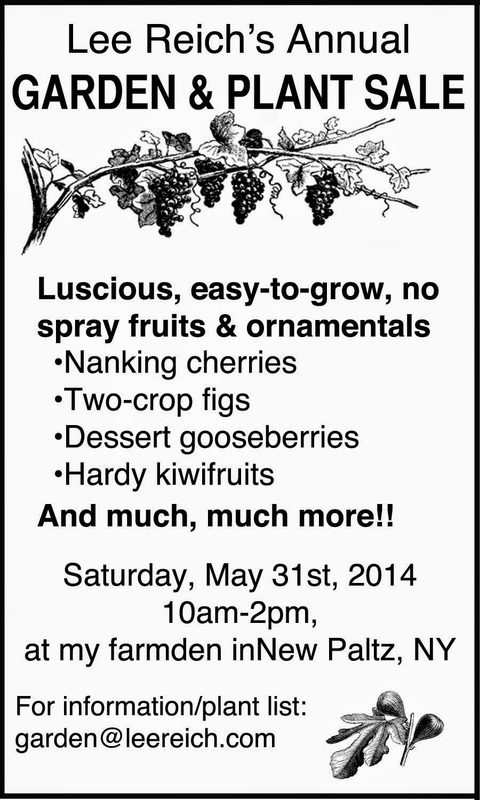 Don’t plant Pixwell; the berries are small, green, and tart. Do plant varieties such as Poorman, Chief, Hinonmakis Yellow, Red Jacket, Captivator, and Glendale. They’re all tasty and disease resistant. If you want even better flavor and you’re willing to deal with powdery mildew, plant varieties such as Colossal, Whitesmith, Achilles, and Webster. Dealing with powdery mildew involves spraying, but it could be something relatively benign, such as horticultural oil, sulfur, baking soda, soap, or horticultural oil plus baking soda (1-1∕2 tablespoons baking soda plus 3 tablespoons oil in 1 gallon water). Right about now, gooseberries can experience one more pest, the imported currantworm, which strips plants of their leaves, beginning at ground level. The leaves will grow back but the plant is left weakened. A spray just as soon as chewing begins will stop this insect in its tracks and, again, benign products such as insecticidal soap or horticultural oil should be effective. I’m training some of my plants as 3-foot-high trees, which might also thwart the worm because there’ll be no leaves near ground level on which the insects can begin their feast. If all this seems like too much potential trouble for gooseberries, it’s not. The best dessert varieties have flavors that might be compared to that of grape, plum, or apricot, and have a “cracking” texture, a crisp flesh that explodes with ambrosial juice when you bite into them. A writer of the last century characterized gooseberries as “the fruit par excellence for ambulant consumption.” I agree, and you might also if they become a known known in your garden.